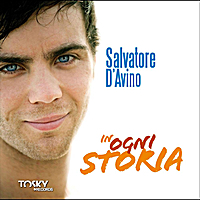 Salvatore D'Avino's first EP.A new italian pop songwriter, he sings love in a funny and relaxed way. The singer-song writer makes his début with his firs EP of unpublished songs proposing a valid alternative in the wide field of the Italian popular music, thanks also to his particular voice. In this work of sound discovery he is supported by excellent artists (Stefano Marazzi, Pietro Casadei, Gianluca Lusi, ..). These songs inject enthusiasm with an extreme freshness and musical honesty. Impossible not to sing them!